Dalai Lama..The Chosen Bodisattvas , Love..Compassion..Peace in Dharamshala ! What does "DALAI LAMA" mean..
Dalai, means “Ocean of Wisdom" in Mongolian title and Lama, means “Guru” in Sanskrit script which is The Great Teacher of Wisdom ! These Holy Souls are the symbols of Bodisattva of Compassion….Chenrezig. All “Bodisattvas” are the Enlightened Souls who have postponed their own Enlightenment ( NIRVANA) and chosen the path of rebirth or re-incarnation to serve human souls ! His Holiness the 14th Dalai Lama was born on July 06th, 1935 in a small village of Taktser in the North Eastern province of Amdo. He was one of the children of a poor farmer’s family who mostly grew barley, buckwheat and potatoes. He was named “Lhamo Thondup” which means literally ‘Wish-Fulfilling Goddess’. 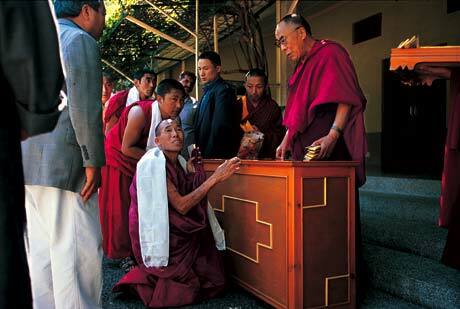 At the birth of His Holiness, many strange ‘auspicious miracles’ happened which foretold of a Great Destiny. The holy child was born early in the morning before sunrise. Much to the surprise of his mother his father who had been ill and bedridden for a long time was suddenly ‘up and walking’! All the ‘thirteen horses’ in his home seem to have gone mad and fell dead. During the three years preceding his birth , Tibet was suffering from the ‘Great Famine.’ With his birth, a new dawn arrived….there was rain and prosperity throughout Tibet ! Child Dalai_Lama-Photo credit: Diana Hughes. “ in the lap of the ‘Sera Aga’ he sat and insisted that he to him his rosary give, it was..it was the rosary of the Thirteenth Holiness ! and as the lama guests rose to depart..the two year old kid was keen that he be taken along !”…..poem ‘Chenresi’, 1987. The Thirteenth Dalai Lama ! His Holiness is held to be the re-incarnation of each of the previous thirteenth Bodhisattvas of Tibet,who in turn are considered to be manifestation of ‘Avalokiteshvara’ or ‘Chenrezig-Bodisattva of Compassion! In the lineage of the seventy fourth ‘Chenrezig’ he can be traced back to a ‘Brahmin Boy’..who lived in the time of The Buddha Sakayamuni . At fifty six, His Holiness, the Dalai-Lama, had accepted that he could feel spiritually connected to all that is..Buddha ! 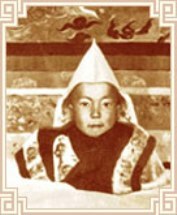 After the demise of Thupten Gyatso, the Thirteenth Dalai Lama, there were many signs which foretold of this Holy Reincarnation. The head of His embalmed body when sitting in state at the Summer Palace of Norbulingka was discovered to have turned North-East from facing South. Shortly afterwards the High Regent Lama had a vision in which he saw the three Tibetan letters..Ah..Ka..Ma in the sacred lake, ‘Lhamo Lhatso.’ It is believed that the letter ‘Ah’ referred to Amdo. 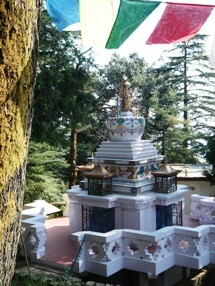 ‘Ka’ indicated the three storeyed turquoise roofed, Khumbum Monastery. The last vision of a small house located in a hill, the roof of which was covered with gnarled branches of juniper wood was where the child Lama…was chosen ! 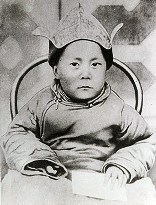 His Holiness The Dalai-Lama, was then taken to Lhasa. 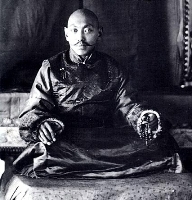 During the winter of 1940, he was recognised as the 'Spiritual leader of Tibet',in Potala Palace. 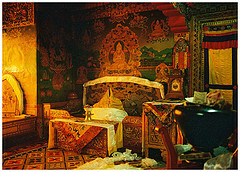 In the Jokhang Temple, he was inducted as a novice monk, in a ceremony known as..'taphue' meaning cutting of the hair! As per ancient custom he assumed His new name..Jamphel Ngawang Lobsang Yeshe Tenzin Gyatso! There His Holiness, received his primary education-Ta doctorate in Buddhist studies...which included Logic,Tibetan Art & Culture,Sanskrit, Medicine and Buddhist Philosophy. Flight to Freedom...The 14th Dalai-Lama..
At fifteen, His Holiness found himself the undisputed Leader of six million people. The next nine years were spent in trying to evade a full scale military take-over by China and placating Tibetan resistant fighters. On March 17th, 1958 the Nechung Oracle ( Personal Protector of the Dalai Lamas ) predicted His life was in danger and advised Him to leave Tibet. On March 10, 1959 His Holiness, The Dalai.Lama, disguised as a common soldier and slipped past the massive throng of people and escaped to India. In 1960, he came with His people to Dharamsala..and blessed this Holy Valley of Kangra with His Enlightened presence! Dalai Lama Dharamsala ! Visit my very own Blog Page, with updating of dharamsala news and my articles on Buddhism and the Dalai Lama..Click Here ! Dharamsala today, invites the interest of International Celebrities and Tourists who come here for Dalai-Lama Teachings and.. to study Spiritual Dharma on home page! 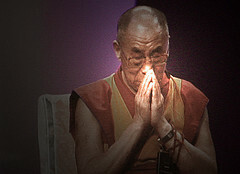 Dalai Lama Teachings, Dharamsala..Contact us, Click Graphic ! Journeys of the Heart, Tibet..
Years ago, in 1995 we had a few selective guests from USA, who had this desire of talking to the Tibetan nomads in the wilderness of Kham and Amdo province of Tibet and to the small Taktser village of His Holiness the Dalai Lama's birth. Although it was a challenge in itself to make the itinerary, to get hold of a tibetan guide from that region and above all to get their Tibet visas, we were game ! The trip was organized with a few 'hiccups' on the way, but we lived to hear the full story from them in Dharamsala after their visit. For your Exotic Holidays in the Himalayas of India, Nepal, Bhutan & Tibet..Contact Us..Click Graphic !